Over the past several years, scientists working in the area of intelligent vehicles have developed predictive braking systems to help prevent rear-end collisions. When your car gets dangerously close to the car in front of you, the system can warn you or automatically put on the brakes. While this intelligent system has the potential to greatly reduce the number of accidents due to inattentive drivers, it also runs the risk of becoming an annoyance as a “backseat driver,” causing drivers to ignore or disable the system. The key to its smooth integration, according to scientists, is training the system to understand its driver’s intentions and respond accordingly. Scientists Joel McCall and Mohan Trivedi from the University of California at San Diego have presented a method for determining whether or not a driver is planning to brake when approaching a vehicle in front of it. The system, which uses eight sensors, plus color cameras, near-infrared cameras and LASER RADAR, minimizes the false alarm rate and maximizes necessary braking action. Of the estimated 300,000 rear-end collisions that occurred in 2000, 65% listed driver inattention as the leading contributing factor, according to the General Estimates System crash database. With a false alarm rate of only 0.2, the braking system successfully predicted a driver’s intention to brake 1 second before at a detection rate of about 0.9 in real-life experimental trials. The scientists wrote that these results show the feasibility and promise of the implementation of intelligent braking systems in the future. McCall and Trivedi’s system captures information about the driver by observing the driver’s head, facial movements (such as the lips), and foot movements, including pedal position, pressure, and hovering. This information is integrated with information about the vehicle and environment, such as acceleration, proximity to other cars, steering wheel position, and use of turn signals. A computer in the vehicle’s trunk captures and synchronizes the data from the different sources. The scientists explain an example situation: When a car gets within a certain distance of the vehicle in front of it, the braking system determines if the driver is alert (for example, if the foot hovers over the brake pedal). If so, then the system recognizes this behavior and doesn’t interfere. If the system senses that the driver is distracted (for example, not facing the road), the system issues a warning. If the driver continues to take no action and the car gets closer, the system automatically applies the brakes. After compiling enough data on the driver’s behavior, the system can even predict when the driver normally starts braking, and issue a warning when the driver deviates from their normal behavior. While their test results have shown that computers can begin to “understand” human behavior, McCall and Trivedi explain that more research is required before this system is commercialized. 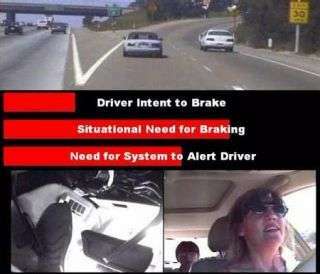 Some challenges include the warning interface: determining types, levels, and methods of warning a driver without causing annoyance or distraction. Citation: McCall, Joel C. and Trivedi, Mohan M. “Driver Behavior and Situation Aware Brake Assistance for Intelligent Vehicles.” Proceedings of the IEEE. Vol. 95, No. 2, February 2007. Read more information on the Laboratory for Intelligent and Safe Vehicles at http://cvrr.ucsd.edu/LISA. A news video can also be viewed at http://www.youtube.com/watch?v=TzTAijNwF9I.